I went for a run today, so I couldn’t bring my SLR. Well, I guess I could have, but it would have been a literal pain in the neck, so I didn’t. It’s the eternal conflict I face in my evenings here- run, get muscles working and music pumping, cover ground and get back in time for dinner, (make my daddy proud of me,) or take my time, collect leaves and feathers, try to sneak up on wildlife, and carry a big lens. So far, I will admit, the walks have taken precedence. Golden hour calls to me, and I take photo after photo of ethereal flowers all backlit and glowing in the settling dust. But running has its benefits too: some of the higher hills nearby are reachable before twilight only at a faster pace, and the views from the top are so much sweeter with the clarity that comes from blood pumping and eyes re-focused from computer screens to the distant sunset. 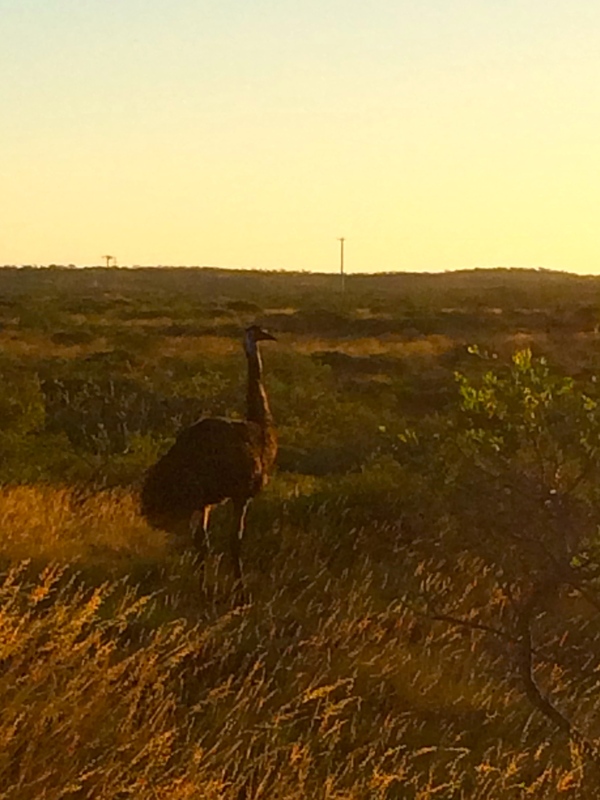 I took photos today on my phone, and the painterly quality that comes from the low light and crappy digital zoom well-represents the haze of a mid-uphill-sprint emu encounter. It’s less detail and more scope, like my runs versus my walks. It’s the sweeping views of the rolling hills and gravel roads, spinifex and shrubs blending into gold and green until the ocean takes over, deep blue to the dusty denim sky. It’s kangaroos that crouch by the side of the road till I’ve jogged by, and only then reveal their presence with a noise or a movement, disappearing back into the bush as I catch a glimpse out of the corner of my eye. I’ve always been fond of impressionism. This entry was posted in Team Sousa and tagged australia, emu, exmouth, iphone, kangaroo, outback, photography, run, running, trail, travel.